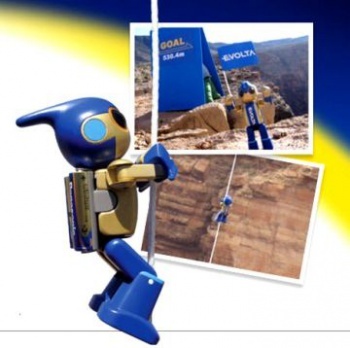 Having climbed the Grand Canyon and cycled round Le Mans, Panasonic's Evolta robot is now set to compete in the grueling Ironman Triathlon. It's been an exhausting year for Panasonic's diminuitive Evolta robot so far, but its trials are far from over. In an attempt to further highlight the durability of the battery that powers it, the Japanese electronics giant has decided to enter Evolta in the Hawaii Ironman Triathlon on October 24. Armed with three different bodies that allow it to switch between swimming, cycling and running, Evolta will have 168 hours to complete the 142 mile long course across varied terrain. 168 hours is roughly ten times the amount of time given to human competitors to complete the race, but since teeny Evolta is roughly one tenth of the size of a human it gets a little leeway. "This is very tough even for a sportsman, but I think it is worth a challenge," said Tomotaka Takahashi, the mind behind Evolta. "The robot will encounter a lot of hardships on its way, but I hope it will overcome them all and succeed in the end." Evolta takes its name from its AA battery, which can be recharged up to 1,800 times via a recharge pad. Having this kind of portable power is what has allowed Evolta to climb the Grand Canyon, cycle round Le Mans for 24 hours, and walk 310 miles from Tokyo to Kyoto. Is it wrong to be envious of a robot's lifestyle? Maybe if our batteries ran on something more than coffee our lives would be as exciting as Evolta's is.